cultural along with natural beauty to discover.It also leaves a free day in Kathmanu at the end of the trek to wind down a little and reflect on your Everest experience. The trek to Everest Base Camp goes right into the heart of Himalayas taking you through the famous Sherpa trading town of Namche and to Thangboche the world’s highest Buddhist monastery and on to Everest Base Camp itself where Sir Edmund Hillary and Tenzing Norgey set off on their epic journey to the summit of Mt. Everest in 1953. Day. 01 Arrive Kathmandu International Airport, MTM staff meet and transfer to Hotel bb basis. Day. 02 Kathmandu Full day Tour in Kathmandu, Patan City. morning Fly to Kathmandu – Lukla(9200ft.) After lunch, hike about 3-4 hours Phakding. Day. 04 Phakding – Namche Bazzar: A short morning walk, then a steep switch back trail up to Namche Bazaar. This main Sherpa town sits at 11,300 ft. and is the center of all Travel and commerce in and out of Khumbu. Day. 05 Namche Free day.This day is a rest day taken for the acclimatization, day hike to Thame and exploring Namche Bazaar known as the gateway to Mt. Everest. Day.06 Namche – Phortse Tenga: Leaving the main trail North to Mt. Everest, we climb high above the river valleys then drop steeply to a Campsite below the Village of Phortse. A short day with spectacular views of Ama Dablam (22490 ft.) Thamserku (21680 ft.) and Kangtaige (22240 ft.). Day. 07 Phortse – Luza: A steep but beautiful morning climb through Pine, Fir and Rhododendron forest,then a long gradual afternoon walk high above the river below at below Luza. Day. 08 Luza – Gokyo: An easy but slow day due to the altitude. We arrive at Gokyo, a high altitude Sherpa settlement long one of many Lakes the dot the west side of the Ngozumpa Glacier. Gokyo and typical altitude seasonal settlements used by the Sherpas to raise livestock and grow Barley and Potatoes. Day. 09 Gokyo – Rest day: A rigorous day’s hike up the ridge above Camp provides spectacular views of the Everest trinity-Nuptse (25850-ft.), Lhotse (27890 ft.) and Everest 29028 ft.) As well as Makalu (27805 ft.) looming of to the East three of the Five highest Mountains on earth with Camp and the Ngozuma Glacier 2000 feet below and immensity of Cho Oyu close to the North- this will be one of the most memorable days of the trek. Day. 10 Gokyo – Thangnak: The trail crosses the Southern portion of the Ngozumpa Glacier then climb steadily to a campsite at 17000 feet directly below the Chhuguima pass. Day. 13 Labuche – Kalapattar – Goraksheep- Labuche: A short walk of about 2 hours brings us to Gorak shep (17000 ft.) which nestles directly beneath the snow cone summit of Pumori (23442 ft.) and sheer west face of Nuptse (25850 ft.). 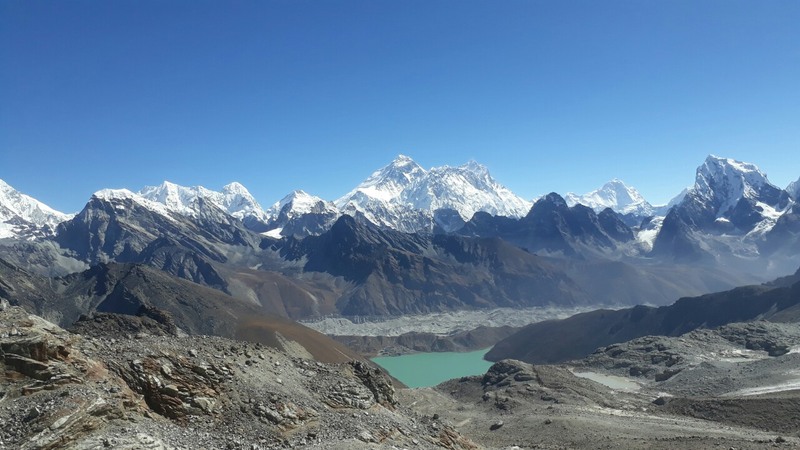 Those well acclimatized, can take short afternoon hikes, either up Kala Patter for sunset viewing of Everest or venture towards Everest Base Camp on the Khumbu Glacier. The glacier day hike under the Everest massif and high above the Khumbu Glacier and Everest Base Camp. One can reach well over 18,000 ft. towards the summit of Pumori with view off into Tibet. About half an hour up the ridge, the black diamond of Mt. 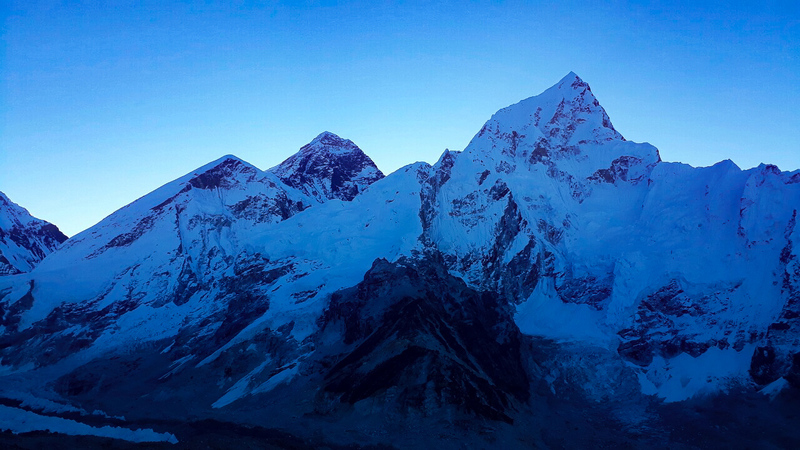 Everest’s south face appears and commands the rest of the day. A hard and dramatic hike which climbs nearly 2700 ft. from camp and ends at a small rock plateau from where one with a little imagination can nearly touch the Nuptse-Lotse wall. Views of Makalu, Pumori, Ama Dablam and Island peak are superb. There are several others less demanding options in the Chhukung Valley. Day. 15 Chukung – Tyangboch: Certainly one of the most beautiful valley walks on earth ending at camp in the lovely meadows of the Thyangboche Monastery. The singular beauty of Ama Dablam commands the entire day. Day. 16 Tyangboche – Namche Bazzar : The trail drop to the Dudha Koshi and towards Namche Bazaar – winding in and out high above the river with views north toward the Everest valley the entire afternoon. Day. 17 Namche – Lukla : A long day walk retracing our steps to the airstrip at Lukla. Day. 19 Kathmandu free day Incase flight problem by weather.